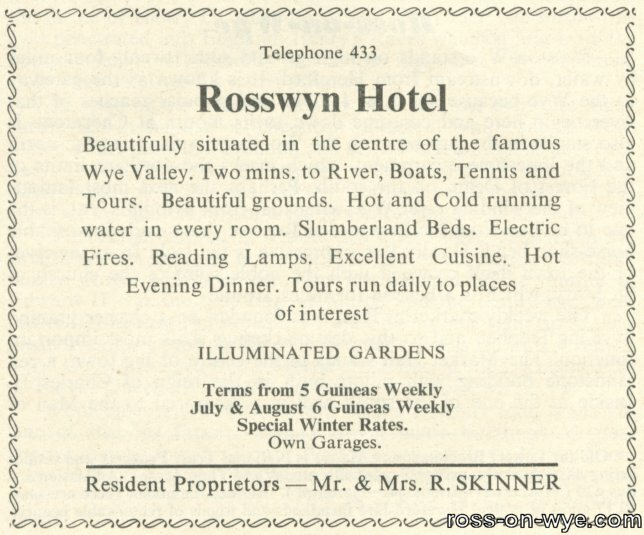 Please could Mr. Skinner, who offered information and photos on the Rosswyn, please contact me again as the email address supplied does not appear to work. 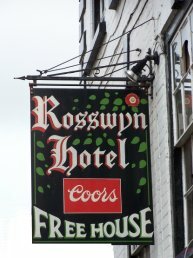 The building at 17 High Street, Ross-on-Wye, was formerly the Rosswyn Hotel. The building dates back to the fifteenth century but the the foundations are much older. During the seventies renovations were carried out and in the bar an old stone fireplace was discovered behind seven other fireplaces and a brick wall. Also during these modernisations an entire room was discovered in the cellars which was thought to be a Priest Hide dating from the Reformation. Other parts of the building boast some interesting details including carving dating back to 1608, a Jacobean staircase and a carved Elizabethan fireplace1. 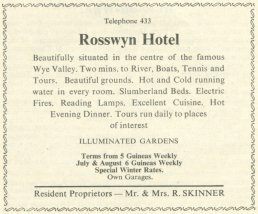 The building did not become a hotel until the 1940s. 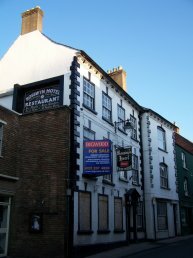 One of its previous uses was as the home of a doctor and his proactice and it was known as Chepstow House1 at that time. 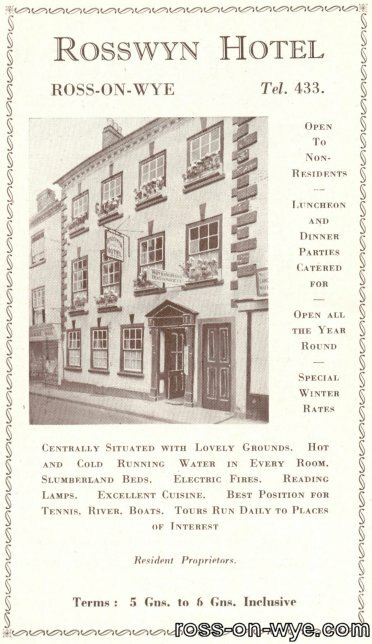 The Hotel was well known due to it being Market Place and it retained an old world atmosphere by having pews in the bar, four-poster beds, oak beams and open fires. 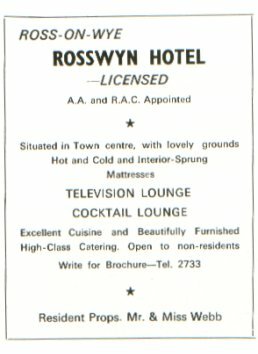 Unusually for a town centre inn, it had large garden that was popular with visitors and locals during the summer months. There was a chap who used to come to the pub in a taxi on a regular basis. He would have two or three doubles (and occasionally triples) of whiskey. The taxi driver would then come into the pub to take him home. He was remarkably steady on his feet considering the amount he put away!!! Another customer who I remember fondly is a gentleman who (I think) used to shave in effect once a year in the summer and then used to let it grow for the rest of the year. He was even Father Christmas once in a shop in Gloucester Road as he had the long bushy white beard already. 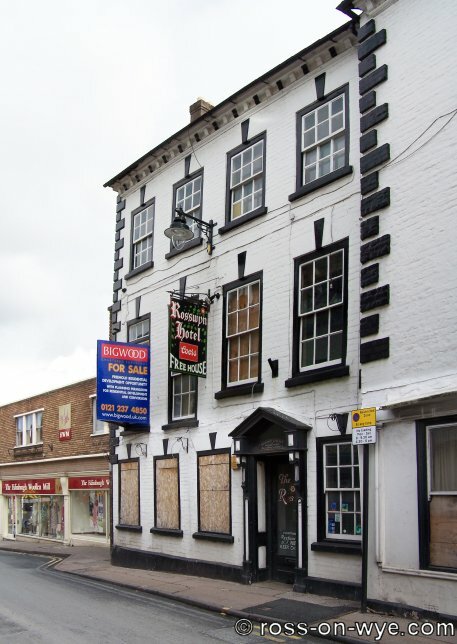 In around 1990 some of the beers on offer included Ruddles Best, Sam Smith's and draught Bass along with pleasant bottles of wine and was probably the only pub in Herefordshire that stocked magnums and the larger bottles of wine4. Owner Rose Livesey said: "Cheltenham Festival week is usually one of our busiest times of years and we rely on it to give us a chance to make up after the Christmas period. This week is the absolute killer for us." Added to this blow, she said there were no casual visitors that they usually get calling in. But in spite of this, the hotel survived the crisis and continued until fire broken out in 2004. 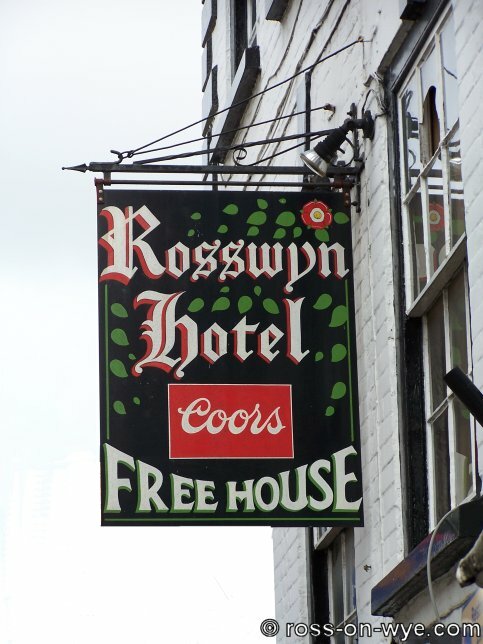 Guests were evacuated from the historic Rosswyn Hotel when it was gutted by fire during the early hours of Wednesday, November 10th. Several fire appliances attended and firefighters with breathing apparatus checked the premises. There was extensive damage to the wood paneled bar. It was thought that an electrical fault [later confirmed] in the bar area was the cause of the fire. 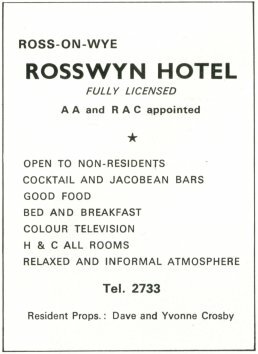 It was hoped that the hotel would re-open sometime in 2005 but this was unfortunately not the case. As seems to be the norm at the moment, it is more profitable to close small hotels and convert them to apartments so on 20th February 2006 listed building consent was requested to convert the building into 6 flats on the 3 floors and to convert the owners cottage into 2 further flats. 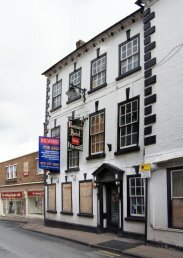 In early April 2008 the property came up for sale including the planning for conversion.